Foxboro Golf Club is nestled on the shore of Lake Marion. 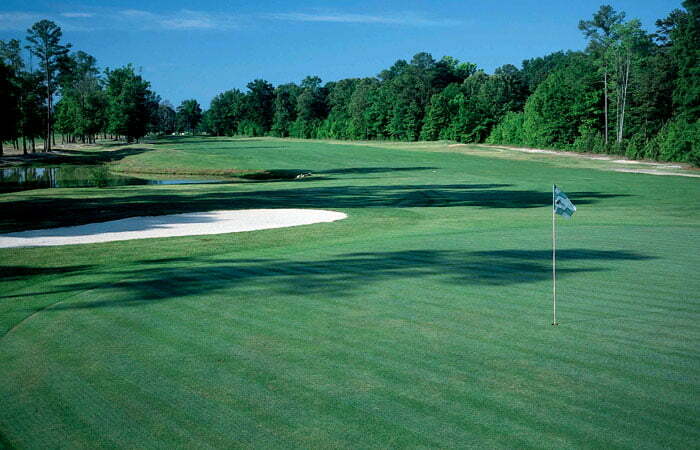 The course presents a great test of ability and a player-friendly round. Foxboro features lovely Bermuda greens – considered some of the finest in the area – to compliment the open links-style layout. The Porter Gibson design is great fun to play and even includes an abundance of wildlife living on or near the grounds. The course is rated 3 stars by Golf Digest’s Places to Play. I-95 North to exit 108. Turn right onto M.G.Hemingway Road and go 1.5 miles to stop sign. Turn left onto Bill Davis Road for 1.4 miles. At Davis crossroads, turn right onto Wash Davis Road. Course is 3.6 miles down on left. Optional UNLIMITED replay for $10 payable at course (based on space available). Features: Pro Shop, Snack Bar, Putting Green, and Club Rentals. Dress Code: Proper golf attire. No cut-offs, gym shorts, or t-shirts. Soft spikes only. Collared shirts preferred. Cooler Policy: Allowed on golf course. No glass and please patronize our snack shop.